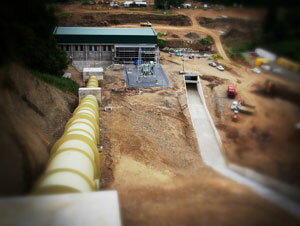 Sorgent.e completed the erection and performed the commissioning of Providencia hydroelectric power plant in Chile. This is the third Chilean plant after Lircay and Mariposa, which was inaugurated on January 2012. The plant is located in the in the Maule region, municipality of San Clemente. It displaces an installed total power of 14 MW and it employs 2 Francis turbines. This will guarantee the production of 58 millions of KWh per year, meeting the demand of around 25.000 families and thus avoiding the emission into the atmosphere of about 70.000 tons of CO2. Together with the plant, the substation and the connecting grid to the other plants of the group have been executed. All of the electromechanical and automation works have been carried out by the subsidiary company S.T.E. Energy. The execution of this plant has guaranteed, together with job opportunities for 300 people, the possibility of establishing a dialogue with local communities, which had already started with the construction of the previous plants, devoted to the development and social assistance of the whole territory and which has recently led to the construction of a school burnt in a fire in 2009.